William von Humbolt wrote of Aeschylus' The Oresteia that "among all the products of the Greek stage, none can compare with it in tragic power; no other play shows the same intensity and pureness of belief in the divine and good; none can surpass the lessons it teaches and the wisdom of which it is the mouthpiece." A sequence of three plays, The Oresteia relays the final tragedies which befall the House of Atreus following the end of the Trojan War. The first play, "Agamemnon," tells of the return of King Agamemnon from Troy and of his murder by his wife and her lover. The second, "The Libation Bearers," details the revenge exacted by Agamemnon's son, Orestes, and daughter, Electra, for their father's death. In the third play of the trilogy, "The Eumenides," Orestes and Apollo go before an Athenian jury to determine their ultimate fate. The only full trilogy to have survived from the ancient Greek playwrights, The Oresteia was first performed at a festival in Athens in 458 B.C. where it won first prize. 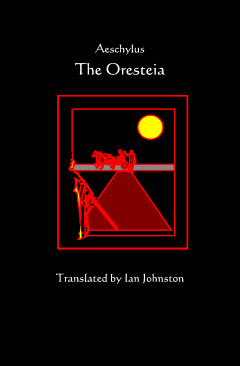 The Oresteia today remains one of the most popular plays of all time. These new dramatic releases provide us once again with that powerful and direct style of translation for which Professor Johnston has become known.